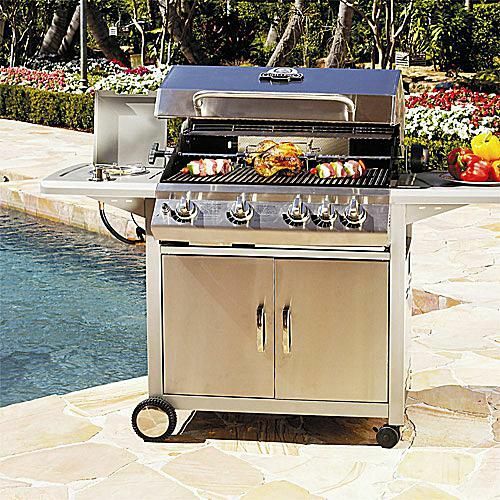 In the field of stainless steel gas grills, this unit is pretty average. A full feature gas grill sold through Ace Hardware for about $400USD. They get this price by using low quality components, low grade stainless steel and Chinese manufacturing. While this grill has everything you'd want in a gas grill, including side burner and infrared rotisserie burner, it doesn't have the quality construction or quality parts that will make it last. What you get is a grill to avoid. This grill has been discontinued. As part of the relationship between Ace Hardware stores and Onward manufacturing (makers of Broil-King grills), they have come together to offer this low budget stainless steel gas grill. This unit has four burners, good BTU output, a decent side burner, full rotisserie system including rear mounted infrared rotisserie burner and complete stainless steel construction. To look at this is a great deal. Dig a little deeper and this isn't a good deal. At around $400 this grill offers a lot for very little money. It does this by relying on low grade (magnetic) stainless steel, poor construction and low quality components. It will look good on the showroom floor, but that appearance simply will not last. This is a grill whose specifications look great, but this grill really shows that you get what you pay for and you simply can't get a good quality stainless steel gas grill for this price.